[191 Pages Report] The global contact center software market size was USD 15.63 billion in 2017 and is projected to reach USD 35.32 billion by 2023, at a Compound Annual Growth Rate (CAGR) of 14.9% during the forecast period (2018–2023). The contact center software empowers organizations to communicate and collaborate effectively through multiple channels, including voice, video, web, and social media. A contact center software helps organizations to automate their inbound and outbound processes. This, in turn, helps boost organizations’ overall productivity. The forecast period considered for this report is 2018 to 2023, and 2017 is the base year for estimating the market size. Customers communicate and collaborate with organizations via a number of channels, such as email, text, voice, mobile, or social media. Omnichannel contact center solutions enable organizations to offer a personal touch to customer interactions, while offering their support and services. Enterprises need a solution that offers centralized control of service delivery over all the different channels; thereby, enterprises have started using omnichannel platforms that integrate all channels and offer a consistent customer experience. The main objective of this report is to define, describe, and forecast the global contact center software market based on components (solutions and services), deployment types, organization sizes, verticals, and regions. The report provides detailed information regarding the major factors influencing the growth of the market (drivers, restraints, opportunities, and industry-specific challenges). The report attempts to forecast the market size with respect to 5 main regions, namely, North America, Europe, Asia Pacific (APAC), Middle East and Africa (MEA), and Latin America. The report strategically profiles key players and comprehensively analyzes their core competencies. This report also tracks and analyzes the competitive developments, such as partnerships, mergers and acquisitions, new product developments, and research and development (R&D) activities in the global market. The research methodology used to estimate and forecast the contact center software market begins with the collection and analysis of data on the key vendor product offerings and business strategies from secondary sources, such as Information Technology (IT) service providers, technology providers, press releases, investor presentations of companies; and white papers, technology journals, certified publications, and articles from recognized authors, directories, and databases. Moreover, the vendor offerings have been taken into consideration to determine the market segmentation. The bottom-up procedures were employed to arrive at the total market size of the market from the revenue of the key market solution and services providers. Post-arrival at the overall market size, the total market was split into several segments and subsegments, which were then verified through primary research by conducting extensive interviews with the key people, such as Chief Executive Officers (CEOs), Vice Presidents (VPs), directors, and executives. The major solution and service providers in the contact center software market include 3CLogic (US), 8x8 (US), Alcatel-Lucent Enterprise (France), Ameyo (Drishti-Soft; India), Aspect Software (US), Avaya (US), BT (England), Cisco (US), Enghouse Interactive (US), Fenero (US), Five9 (US), Genesys (US), Huawei (China), IBM (US), Mitel (Canada), NEC (Japan), NICE (Israel), Oracle (US), RingCentral (US), SAP (Germany), Solgari (Ireland), Unify (Germany), Verizon (US), Vocalcom (France), West Corporation (US), Zendesk (US), and ZTE (China). In May 2018, NICE launched NICE inContact CXone Workforce Optimization (WFO) Pro suite to be deployed on traditional on-premises telephony platforms. NICE inContact CXone Workforce Optimization Pro suite enabled organizations to provide enhanced customer experience while improving employee engagement and productivity. In May 2018, 3CLogic partnered with ServiceNow to offer native integration solutions into ServiceNow platform. This partnership enabled 3CLogic to deploy its solutions across four continents. In February 2018, Cisco Systems acquired BroadSoft. The acquisition aimed to accelerate Cisco's cloud strategy and collaboration portfolio by adding cloud calling and contact center solutions to Cisco's calling, meetings, messaging, customer care, hardware endpoints, and services portfolio. What are new contact center solutions which enterprises are exploring? 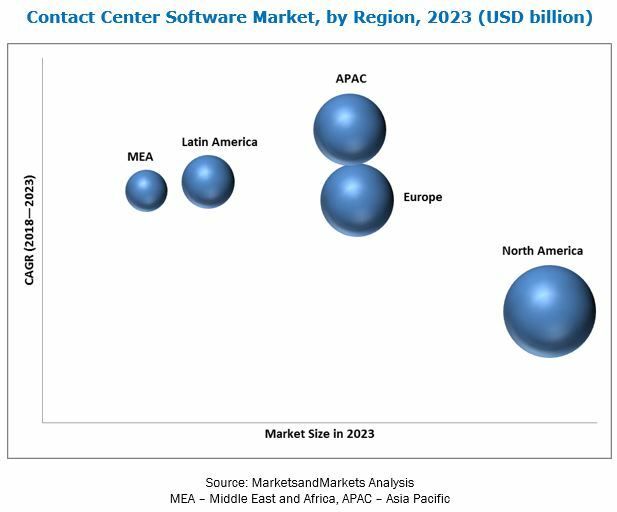 The contact center software market is expected to grow from USD 17.65 billion in 2018 to USD 35.32 billion by 2023, at a Compound Annual Growth Rate (CAGR) of 14.9% during the forecast period. Increasing use of contact center solutions among organizations to offer customers with enhanced experience through multiple channels including the voice, video, web, mobile, and social media is one of the major growth factors for the market. The contact center software offers competitive advantages by increasing productivity of organizations through the automation of inbound and outbound operations of contact center. Evolution of the technology has changed the way enterprises deal with potential customers. Intelligent communication that offers ubiquitous working environment to interact with the customers has become the basic requirement for customer-centric enterprises. The contact center software is a communication and collaboration application that enables users to resolve inbound queries and manage outbound to serve or acquire customers. The implementation of contact center software helps organizations to communicate effectively with customers through different channels and to manage customer queries efficiently. Enhanced business agility, improved business continuity, are driving the growth of cloud-based contact center software market. Professional services are a major service type in the global market. Professional services include integration and implementation, consulting, and training and support for contact center software. The managed services type is expected to record a higher adoption rate than professional services. Managed services help organizations to focus on their core business functions while delegating contact center operations to professionals. Managed service providers ensure efficient management of contact center processes and simultaneously deliver enhanced customer experience through multiple channels. Major industry verticals, such as banking, financial services, and insurance (BFSI); consumer goods and retail; healthcare; IT and telecom; and travel and hospitality, are increasingly adopt contact center software and services. The retail and consumer goods industry vertical is expected to grow at the highest rate in the global contact center software market during the forecast period. North America is expected to hold the largest market size and dominate the global market from 2018 to 2023. This is mainly due to the high focus on innovations obtained from research and development and technology adoption, especially in the developed economies of North America. The high adoption rate of cloud, mobile, analytics, and social media among enterprise across industry verticals is expected to help contact center market to grow in North America. APAC is expected to be the fastest-growing region in the global contact center software market, owing to the presence of considerable number of SMEs and a broad customer base in the region. However, difficulty in integrating new age digital contact center solutions with existing legacy systems of organizations may restrain the growth of the market. Major vendors in the market include 3CLogic (US), 8x8 (US), Alcatel-Lucent Enterprise (France), Ameyo (Drishti-Soft; India), Aspect Software (US), Avaya (US), BT (England), Cisco (US), Enghouse Interactive (US), Fenero (US), Five9 (US), Genesys (US), Huawei (China), IBM (US), Mitel (Canada), NEC (Japan), NICE (Israel), Oracle (US), RingCentral (US), SAP (Germany), Solgari (Ireland), Unify (Germany), Verizon (US), Vocalcom (France), West Corporation (US), Zendesk (US), and ZTE (China). These vendors have adopted different types of organic and inorganic growth strategies, such as new product launches, partnerships and collaborations, and mergers and acquisitions to expand their offerings in the global market. *Details on Business Overview, Solutions Offered, Recent Developments, and MnM View Might Not Be Captured in Case of Unlisted Companies.